We sat down with author Joyce Maynard to find out why teaching Josh Brolin, who plays an escaped murderer, to bake a pie was so crucial to this movie’s success. Her answer will inspire you. Author Joyce Maynard is no virgin when it comes to Hollywood adapting her novels to film. Her book To Die For was turned into a hit movie starring Nicole Kidman and a young Joaquin Phoenix back in 1995, directed by Gus Van Sant. We wanted to know what it’s like to go from being completely in control of her artistic vision to being part of a collaborative process like filmmaking. Maynard describes Labor Day‘s lead character Adele, played soulfully by Kate Winslet, as “a person with some miles, some hard experiences and big losses behind her who still has hopes and dreams. This wasn’t a role to be played by a 22-year-old ingenue, this was a real, grown-up love affair.” Thank you for remembering the rest of us, Joyce. 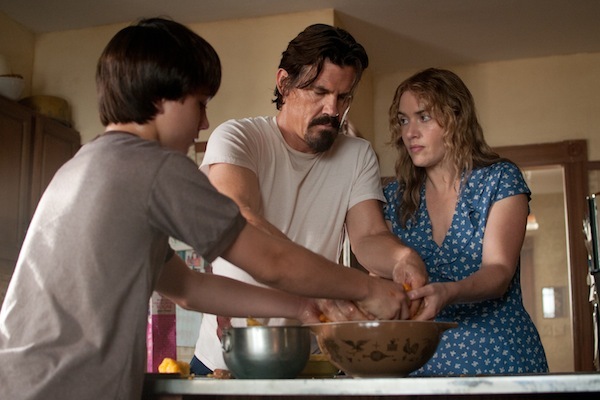 Not only did Jason Reitman direct Labor Day, he also penned the screenplay. We asked Maynard what it was like to read it. “I made notes in couple of places, but basically, I recognize that it’s a different form and it needs to be respected,” she said, apparently at peace with the process. It was paramount to Maynard that the pie look like one made by a convict on the run — which she claims happens to be exactly what her own pies look like. So how did Brolin show off his new skill as master baker? He made a pie every single day of the two-month shoot. That’s a lot of pies! We couldn’t resist asking the author, who’s known for having a romance with the famously reclusive author J.D. Salinger when she was just 18: If her life was a pie, what kind of pie would it be? The chatty author laughed. “Well, it’s not about the filling. And it’s not about the recipe. You can’t learn life from the recipe.” So true. There were some differences between the book and movie, she said, but they were mostly omissions. Another omission was Frank’s grandmother, who doesn’t exist in the movie. But Maynard claims the spirit of the novel remained very true in the film. “Among other things, it’s very much a book about coming of age. There are two people who are discovering sexuality at very different stages of life — Henry and Adele. It’s part of what’s uncomfortable for Henry. He’s just coming into his own tender, vulnerable sexuality when his mother is having this passionate, romantic but also sexual relationship under the same roof as him,” she said. Joyce, we can’t wait to see your forthcoming screenplay up on the big screen! Labor Day opens Jan. 31.